The League: The League: "The Draft"
The League premieres tonight at 10:30 p.m. ET/9:30 p.m. CT on FX, after It's Always Sunny In Philadelphia. When it comes to comedy programming, FX is leagues ahead of networks twice its size, including its obvious parent FOX: This little dial on the ol' idiot box knows that comedies are best when you let the funny people do their thing. The show might not revolutionize all things comedy, but at least show creators know there's a place to take risks, a network to support that. It's Always Sunny In Philadelphia is the ultimate example of that; FX plucked these unknowns out of obscurity, allowed them to maintain almost all creative control, and the results speak for themselves. Last year they tried it again with Testees, which was created by Kenny of Kenny Vs. Spenny, and while the show wasn't another Always Sunny, it was at least a noble effort. Now the network is attempting two new comedies—Louie, the new Louis C.K. project that will 1) probably be awesome and 2) will premiere in 2010, and this new fantasy football-focused show The League. What FX is not good at, though, is making trailers for its shows. Every promo for The League made it seem like the ultimate exercise in pandering to a demographic: Bros speaking like bros, and talking about fantasy football. Grunt and chug a beer. But I'm thrilled to report that's not the case. The League is equal parts smart and silly, much more about the guys' friendships than, even, fantasy football. That last part has been a chief complaint among critics, but if episodes are going to be as fun and breezy as this pilot, it's not going to bother me. The chief reason for The League's success is the way it's shot. It's created, directed, and written by Jeff Schaffer, who cut his teeth over on Curb Your Enthusiasm, where scenes are only loosely scripted and the actors are giving free reign to improvise around a shell of a scene idea. It works on Curb because the end of each scene is in sight, and there's no jarring cutting right to the jokey lines (a common complaint of mine, which happens often when people film improv—they're scared of there not being jokes for even one second). And it works here, as well. Set in Chicago—though other than a few cut scenes, it doesn't really matter—the show follows five friends who are part of an ongoing fantasy football league. Each is at a different stage of his life. Ongoing champion and league organizer Pete is super cocky in front of his friends, but is clearly whipped by a girlfriend who wants a kid, marriage, ideally both. (And she hates fantasy football.) Kevin is married with a little girl, though he's way into the league—his wife is, too, and she calls all the shots on the team. Taco (Internet star Jon LaJoie) is a burnout, Andre (Human Giant's Paul Scheer) is a spoiled rich bachelor, and Ruxin (Nick Kroll, guy who's been in everything) is a new dad with only fleeting moments for football. The show is largely improvised, and each of the actors who play the leads are adept at the art, so the best scenes come later, when everyone has the chance to interact. They first find themselves at a party for Kevin's daughter ("She's spelling words now" [Cut to refrigerator and "whore" spelled out in magnets.] Taco: "I can see that…") and need to determine the draft order for the season. So each is assigned a kid in a potato sack race, and whoever's kid finishes first gets the first pick. Ruxin corners a kid who's labeled "The Oracle," a fantasy football prodigy, and the two creepily bond on the swing set. The rest of the group gathers around Taco to hear the song he wrote for the little girl, and it's, well, really filthy. ("His wee-wee was hard.") The series of scenes is loose, funny, and it sets up the draft order. Not heavy handed with unnecessary character details, not packing too many jokes into places they don't belong. Plus, it's a way to deal with some football-related business without feeling too insidery. Because the scenes are only loosely scripted, there's an immediacy to the dialogue that adds weight and ridiculousness to the proceedings. Ruxin continues to pursue The Oracle, which means he shows up to his house and asks if he's available to come play; the ensuing conversation with the dad (Matt Walsh) is drenched in creepiness. Andre brings everyone to his loft for the draft, and keeps trying to make a toast, but the other guys keep taking sips and interrupting him; Scheer gets to play the put-upon frustration he's used to great effect on Human Giant in the past. The League pilot doesn't cover much football, sure, and it doesn't delve much into the character's lives. But it does set up the dynamics between each person and the way they're going to interact from here on out. And because the guys came about to it naturally, through improv, it feels anything but forced. So who cares if the show doesn't delve into the nitty gritty of fantasy football? It's taken a bunch of young comically gifted actors and given them a promising construct to improvise around, filming it with a loose touch of the camera. 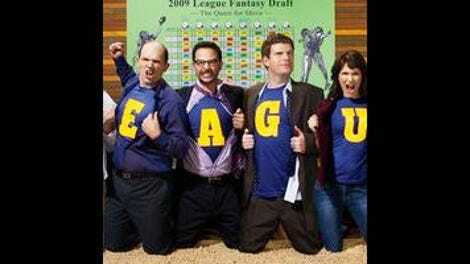 The League is exactly what it should be, and it's pretty damn funny. "I'm Taco." "Taco, hi, we've been friends for 15 years." "I don't want to sleep in Ed Hardy pajamas." "… bring your own pajamas." Also, great guest stint by Rob Huebel. Even though he plays essentially the same cocky character in everything he does, he plays it well.